Here’s a familiar scenario to many SLPs. 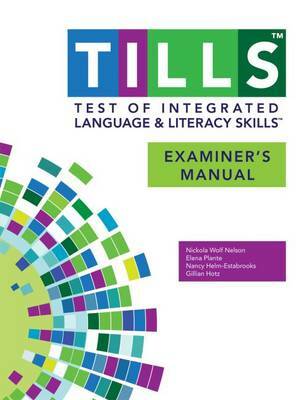 You’ve administered several standardized language tests to your student (e.g., CELF-5 & TILLS). You expected to see roughly similar scores across tests. Much to your surprise, you find that while your student attained somewhat average scores on one assessment, s/he had completely bombed the second assessment, and you have no idea why that happened. So you go on social media and start crowdsourcing for information from a variety of SLPs located in a variety of states and countries in order to figure out what has happened and what you should do about this. Of course, the problem in such situations is that while some responses will be spot on, many will be utterly inappropriate. Luckily, the answer lies much closer than you think, in the actual technical manual of the administered tests. So what is responsible for such as drastic discrepancy? A few things actually. For starters, unless both tests were co-normed (used the same sample of test takers) be prepared to see disparate scores due to the ability levels of children in the normative groups of each test. Another important factor involved in the score discrepancy is how accurately does the test differentiate disordered children from typical functioning ones. Let’s compare two actual language tests to learn more. 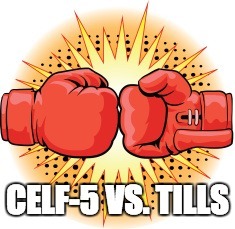 For the purpose of this exercise let us select The Clinical Evaluation of Language Fundamentals-5 (CELF-5) and the Test of Integrated Language and Literacy (TILLS). The former is a very familiar entity to numerous SLPs, while the latter is just coming into its own, having been released in the market only several years ago. Both tests share a number of similarities. Both were created to assess the language abilities of children and adolescents with suspected language disorders. Both assess aspects of language and literacy (albeit not to the same degree nor with the same level of thoroughness). Both can be used for language disorder classification purposes, or can they? In other words, obtaining a standard score of 80 on the CELF – 5 indicates that a child presents with a language disorder. Of course, as many SLPs already know, the eligibility criteria in the schools requires language scores far below that in order for the student to qualify to receive language therapy services. Of course, this begs the question, why would anyone continue to administer any test to students, if its administration A. Does not guarantee disorder identification B. Will not make the student eligible for language therapy despite demonstrated need? The problem is that even though SLPs are mandated to use a variety of quantitative clinical observations and procedures in order to reliably qualify students for services, standardized tests still carry more value then they should. Consequently, it is important for SLPs to select the right test to make their job easier. 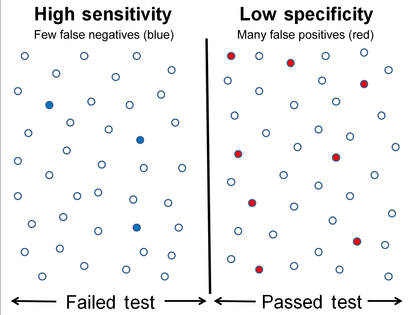 Review the sensitivity and specificity of your test/s, take a look at the normative samples, see if anything unusual jumps out at you, which leads you to believe that the administered test may have some issues with assessing what it purports to assess. Then, after supplementing your standardized testing results with good quality clinical data (e.g., narrative samples, dynamic assessment tasks, etc. ), consider creating a solidly referenced purchasing pitch to your administration to invest in more valid and reliable standardized tests. Hope you find this information helpful in your quest to better serve the clients on your caseload. If you are interested in learning more regarding evidence-based assessment practices as well as psychometric properties of various standardized speech-language tests visit the SLPs for Evidence-Based Practice group on Facebook learn more. Peña ED, Spaulding TJ, and Plante E. ( 2006) The composition of normative groups and diagnostic decision-making: Shooting ourselves in the foot. American Journal of Speech-Language Pathology 15: 247–54. Spaulding, T. J., Plante, E., & Farinella, K. A. (2006). Eligibility criteria for language impairment: Is the low end of normal always appropriate? 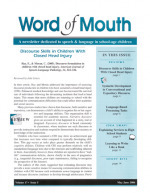 Language, Speech, and Hearing Services in Schools, 37, 61-72. Vance, R., & Plante, E. (1994). Selection of preschool language tests: A data-based approach. Language, Speech, and Hearing Services in Schools, 25, 15-24. 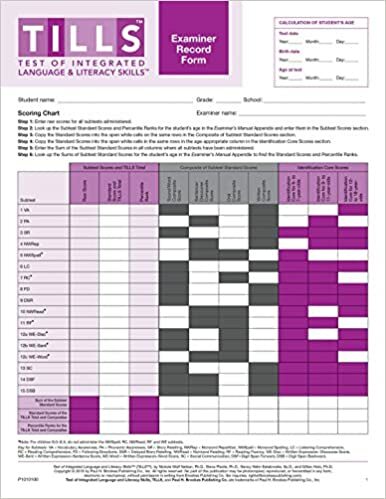 Today I am reviewing a new receptive vocabulary measure for students 7-17 years of age, entitled the Test of Semantic Reasoning (TOSR) created by Beth Lawrence, MA, CCC-SLP and Deena Seifert, MS, CCC-SLP, available via Academic Therapy Publications. The TOSR assesses the student’s semantic reasoning skills or the ability to nonverbally identify vocabulary via image analysis and retrieve it from one’s lexicon. According to the authors, the TOSR assesses “breadth (the number of lexical entries one has) and depth (the extent of semantic representation for each known word) of vocabulary knowledge without taxing expressive language skills”. The test was normed on 1117 students ranging from 7 through 17 years of age with the norming sample including such diagnoses as learning disabilities, language impairments, ADHD, and autism. This fact is important because the manual did indicate how the above students were identified. According to Peña, Spaulding and Plante (2006), the inclusion of children with disabilities in the normative sample can negatively affect the test’s discriminant accuracy (separate typically developing from disordered children) by lowering the mean score, which may limit the test’s ability to diagnose children with mild disabilities. TOSR administration takes approximately 20 minutes or so, although it can take a little longer or shorter depending on the child’s level of knowledge. It is relatively straightforward. You start at the age-based point and then calculate a basal and a ceiling. For a basal rule, if the child missed any of the first 3 items, the examiner must go backward until the child retains 3 correct responses in a row. To attain a ceiling, test administration can be discontinued after the student makes 6 out of 8 incorrect responses. Students then must select the single word from a choice of four that best represents the multiple contexts of the word represented by all the images. 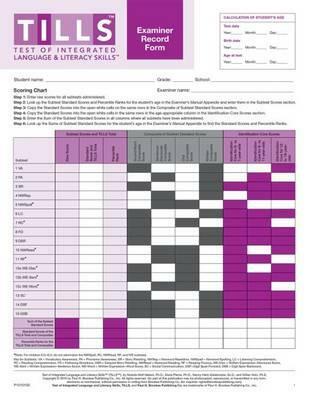 During the time I had this test I’ve administered it to 6 students on my caseload with documented history of language disorders and learning disabilities. Interestingly all students with the exception of one had passed it with flying colors. 4 out of 6 received standard scores solidly in the average range of functioning including a recently added to the caseload student with significant word-finding deficits. Another student with moderate intellectual disability scored in the low average range (18th percentile). Finally, my last student scored very poorly (1st%); however, in addition to being a multicultural speaker he also had a significant language disorder. He was actually tested for a purpose of a comparison with the others to see what it takes not to pass the test if you will. I was surprised to see several children with documented vocabulary knowledge deficits to pass this test. Furthermore, when I informally used the test and asked them to identify select vocabulary words expressively or in sentences, very few of the children could actually accomplish these tasks successfully. As such it is important for clinicians to be aware of the above finding since receptive knowledge given multiple choices of responses does not constitute spontaneous word retrieval. 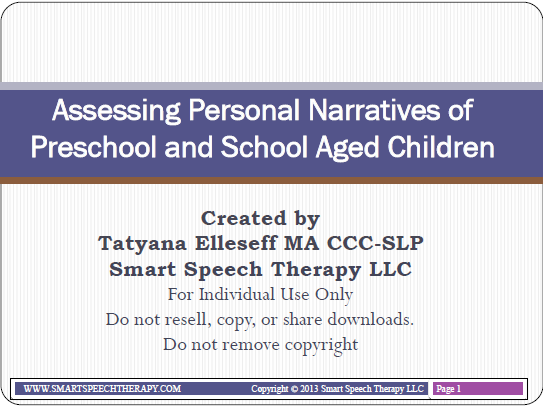 Consequently, I caution SLPs from using the TOSR as an isolated vocabulary measure to qualify/disqualify children for services, and encourage them to add an informal expressive administration of this measure in words in sentences to get further informal information regarding their students’ expressive knowledge base. I also caution test administration to Culturally and Linguistically Diverse (CLD) students (who are being tested for the first time vs. retesting of CLD students with confirmed language disorders) due to increased potential for linguistic and cultural bias, which may result in test answers being marked incorrect due lack of relevant receptive vocabulary knowledge (in the absence of actual disorder). I think that SLPs can use this test as a replacement for the Receptive One-Word Picture Vocabulary Test-4 (ROWPVT-4) effectively, as it does provide them with more information regarding the student’s reasoning and receptive vocabulary abilities. I think this test may be helpful to use with children with word-finding deficits in order to tease out a lack of knowledge vs. a retrieval issue. You can find this assessment for purchase on the ATP website HERE. Finally, due to the generosity of one of its creators, Deena Seifert, MS, CCC-SLP, you can enter my Rafflecopter giveaway below for a chance to win your own copy! Disclaimer: I did receive a complimentary copy of this assessment for review from the publisher. Furthermore, the test creators will be mailing a copy of the test to one Rafflecopter winner. However, all the opinions expressed in this post are my own and are not influenced by the publisher or test developers. As an SLP who routinely conducts speech and language assessments in several settings (e.g., school and private practice), I understand the utility of and the need for standardized speech, language, and literacy tests. However, as an SLP who works with children with dramatically varying degree of cognition, abilities, and skill-sets, I also highly value supplementing these standardized tests with functional and dynamic assessments, interactions, and observations. Since a significant value is placed on standardized testing by both schools and insurance companies for the purposes of service provision and reimbursement, I wanted to summarize in today’s post the findings of recent articles on this topic. Since my primary interest lies in assessing and treating school-age children, for the purposes of today’s post all of the reviewed articles came directly from the Language Speech and Hearing Services in Schools (LSHSS) journal. We’ve all been there. 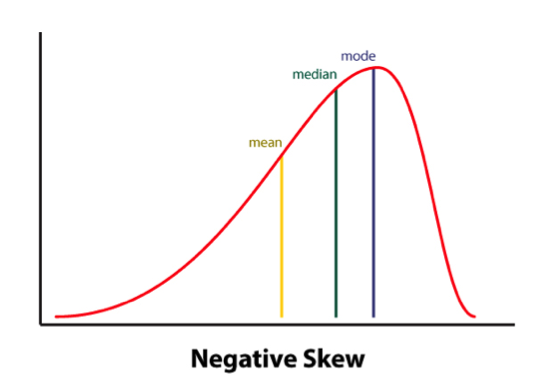 We’ve all had situations in which students scored on the low end of normal, or had a few subtest scores in the below average range, which equaled an average total score. We’ve all poured over eligibility requirements trying to figure out whether the student should receive therapy services given the stringent standardized testing criteria in some states/districts. Of course, as it turns out, the answer is never simple. In 2006, Spaulding, Plante & Farinella set out to examine the assumption: “that children with language impairment will receive low scores on standardized tests, and therefore [those] low scores will accurately identify these children” (61). So they analyzed the data from 43 commercially available child language tests to identify whether evidence exists to support their use in identifying language impairment in children. Consequently, they created a decision tree (see below) with recommendations for clinicians using standardized testing. They recommend using alternate sources of data (sensitivity and specificity rates) to support accurate identification (available for a small subset of select tests). Fast forward 6 years, and a number of newly revised tests later, in 2012, Spaulding and colleagues set out to “identify various U.S. state education departments’ criteria for determining the severity of language impairment in children, with particular focus on the use of norm-referenced tests” as well as to “determine if norm-referenced tests of child language were developed for the purpose of identifying the severity of children’s language impairment” (176). 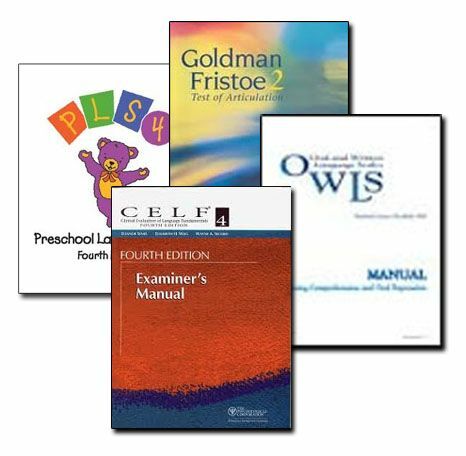 They obtained published procedures for severity determinations from available U.S. state education departments, which specified the use of norm-referenced tests, and reviewed the manuals for 45 norm-referenced tests of child language to determine if each test was designed to identify the degree of a child’s language impairment. Thus they urged SLPs to exercise caution in determining the severity of children’s language impairment via norm-referenced test performance “given the inconsistency in guidelines and lack of empirical data within test manuals to support this use (176)”. They listed a variety of examples from several different state departments of education (FL, NC, VA, etc. ), which mandate the use of functional assessments, dynamic assessments criterion-referenced assessments, etc. for their determination of language therapy eligibility. Their purpose was to determine “whether the quality of standardized tests, as measured by the test’s psychometric properties, is related to how frequently the tests are used in clinical practice” (133). What they found out was that the most frequently used tests were the comprehensive assessments including the Clinical Evaluation of Language Fundamentals and the Preschool Language Scale as well as one word vocabulary tests such as the Peabody Picture Vocabulary Test. Furthermore, the date of publication seemed to be the only factor which affected the frequency of test selection. If since the time (2012) SLPs have not significantly change their practices, the above is certainly disheartening, as it implies that rather than being true diagnosticians, SLPs are using whatever is at hand that has been purchased by their department to indiscriminately assess students with suspected speech language disorders. If that is truly the case, it certainly places into question the Ireland, Hall-Mills & Millikin’s response to Spaulding and colleagues. 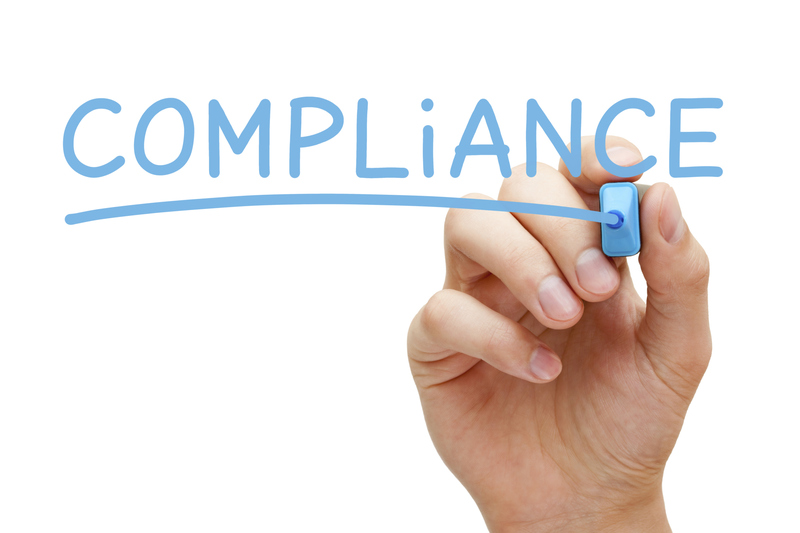 In other words, though SLPs are aware that they need to comply with state and federal regulations when it comes to unbiased and targeted assessments of children with suspected language disorders, they may not actually be using appropriate standardized testing much less supplementary informal assessments (e.g., dynamic, narrative, language sampling) in order to administer well-rounded assessments. Now that we have identified a problem, we need to develop and consistently implement effective practices to ameliorate it. These include researching psychometric properties of tests to review sample size, sensitivity and specificity, etc, use domain specific assessments to supplement administration of comprehensive testing, as well as supplement standardized testing with a plethora of functional assessments. SLPs can review testing manuals and consult with colleagues when they feel that the standardized testing is underidentifying students with language impairments (e.g., HERE and HERE). They can utilize referral checklists (e.g., HERE) in order to pinpoint the students’ most significant difficulties. Finally, they can develop and consistently implement informal assessment practices (e.g., HERE and HERE) during testing in order to gain a better grasp on their students’ TRUE linguistic functioning. Stay tuned for the second portion of this post entitled: “What Research Shows About the Functional Relevance of Standardized Speech Tests?” to find out the best practices in the assessment of speech sound disorders in children. Spaulding, Plante & Farinella (2006) Eligibility Criteria for Language Impairment: Is the Low End of Normal Always Appropriate? Today due to popular demand I am reviewing the The Test of Written Language-4 or TOWL-4. TOWL-4 assesses the basic writing readiness skills of students 9:00-17:11 years of age. The tests consists of two forms – A and B, (which contain different subtest content). For detailed information regarding the TOWL-4 development and standardization, validity and reliability, please see HERE. Below are my impressions (to date) of using this assessment with students between 11-14 years of age with (known) mild-moderate writing impairments. 1. Vocabulary – The student is asked to write a sentence that incorporates a stimulus word. E.g. : For ‘ran’, a student may write, “I ran up the hill.” The student is not allowed to change the word in any way, such as write ‘running’ instead of run’. If this occurs, an automatic loss of points takes place. Ceiling is reached when the student makes 3 errors in a row. Form A (#1-20): eat, tree, house, circus, walk, bird, edge, laugh, donate, faithful, aboard, humble, though, confusion, lethal, deny, pulp, verge, revive, intact, etc. Form B (#1-20): see, help, prize, sky, stove, cry, enormous, chimney, avoid, nonsense, snout, wept, exotic, cycle, deb, specify, debatable, pastel, rugged, studious, etc. These words may work well to test the knowledge of younger children but they do not take into the account the challenging academic standards set forth for older students. As a result, students 11+ years of age may pass this subtest with flying colors but still present with a fair amount of difficulty usingsophisticated vocabulary words in written compositions. 2/3. Spelling and Punctuation (subtests 2 and 3). These two subtests are administered jointly but scored separately. Here, the student is asked to write sentences dictated by the examiner using appropriate rules for spelling and punctuation and capitalization. Ceiling for each subtest is reached separately. It occurs when the student makes 3 errors in a row in each of the subtests. In other words if a student uses correct punctuation but incorrect spelling, his/her ceiling on the ‘Spelling’ subtest will be reached sooner then on the ‘Punctuation’ subtest and vise versa. Form A: (2) Run away. ; (3) Birds fly. ; (9) Who ate the food? (17) The electricity failed in Dallas, Texas. ; (22) Because of the confusion, she sought legal help. Form B: (3) Am I going? ; (18) Bring back three items: milk, crackers, and butter. ; (23) After the door was closed, the sound was barely audible. As you can see from the above, the requirements of these subtest are also not too stringent. The spelling words are simple and the punctuation requirements are very basic: a question mark here, an exclamation mark there, with a few commas in between. But I was particularly disappointed with the ‘Spelling‘ subtest. Here’s why. I have a 6th grade client on my caseload with significant well-documented spelling difficulties. When this subtest was administered to him he scored within the average range (Scaled Score of 8 and Percentile Rank of 25). However, an administration of Spelling Performance Evaluation for Language and Literacy – SPELL-2, yielded 3 assessment pages of spelling errors, as well as 7 pages of recommendations on how to remediate those errors. Had he received this assessment as part of an independent evaluation from a different examiner, nothing more would have been done regarding his spelling difficulties, since the TOWL-4 revealed an average spelling performance due to it’s focus on overly simplistic vocabulary. 4. Logical Sentences – The student is asked to edit an illogical sentence so that it makes better sense. E.g. : “John blinked his nose” is changed to “John blinked his eye.” Ceiling is reached when the student makes 3 errors in a row. Again I’m not too thrilled with this subtest. Rather than truly attempting to ascertain the student’s grammatical and syntactic knowledge at sentence level a large portion of this subtest deals with easily recognizable semantic incongruities such as the one above. 5. Sentence Combining – The student integrates the meaning of several short sentences into one grammatically correct written sentence. E.g. : “John drives fast” is combined with “John has a red car,” making “John drives his red car fast.” Ceiling is reached when the student makes 3 errors in a row. The first few items contain only two sentences which can be combined by adding the conjunction “and” . Remaining items are a bit more difficult due to the a. addition of more sentences and b. increase in the complexity of language needed to efficiently combine them. This is a nice subtest to administer to students who present with difficulty effectively and efficiently expressing their written thoughts on paper. It is particularly useful with students who write down a lot of extraneous information in their compositions/essays and frequently overuse run-on sentences. 6. Contextual Conventions – The student is asked to write a story in response to a stimulus picture. S/he earn points for satisfying specific requirements (identified below) relative to combined orthographic (E.g. : punctuation, spelling) and grammatical conventions (E.g. : sentence construction, noun-verb agreement). The student’s written composition needs to contain more than 40 words in order for the effective analysis to take place. The scoring criteria ranges from no credit or a score of 0 ( based on 3 or more mistakes), to partial credit, a score of 1 (based on 1-2 mistakes) to full a credit – a score of 3 (no mistakes). While the above criteria is highly useful for younger elementary-aged students who may exhibit significant difficulties in the domain of writing, older middle school and high-school aged students as well as elementary aged students with moderate writing difficulties may attain average scoring on this subtest but still present with significant difficulties in this area as compared to typically developing grade level peers. As a result, in addition to this assessment it is recommended that a functional assessment of grade level writing also be performed in order to accurately identify the student’s writing needs. 7. Story Composition – The student’s story is evaluated relative to the quality of its composition (E.g. : vocabulary, plot, prose, development of characters, and interest to the reader). The examiner first provides the student with an example of a good story by reading one written by another student. Then, the examiner provides the student with an appropriate picture card and tell them that they need to take time to plan their story and make an outline on the (also provided) scratch paper. The student has 5 minutes to plan before writing the actual story. After the 5 minutes, elapses they 15 minutes to write the story. It is important to note that story composition is the very first subtest administered to the student. Once they complete it they are ready to move on to the Vocabulary subtest. With respect to this subtest it was significantly more useful for me to use with younger students as well as significantly impaired students vs. older students or students with mild-moderate writing difficulties. Again if your aim is to get an accurate picture of the older students writing abilities I definitely recommend usage of informal writing assessment rubrics based on the student’s grade level in order to have an accurate picture of their abilities. Overall, I do find TOWL-4 a very useful testing measure to have in my toolbox as it is terrific for ruling out weaknesses in the student’s basic writing abilities, with respect to simple vocabulary, sentence construction, writing mechanics, punctuation, etc. If I identify previously unidentified gaps in basic writing skills I can then readily intervene, where needed, if needed. However, it is important to understand that the TOWL-4 is only a starting point for most of our students with complex literacy needs whose writing abilities are above severe level of functioning. Most students with mild-moderate writing difficulties will pass this test with flying colors but still present with significant writing needs. As a result I highly recommend a functional grade level writing assessment as a supplement to the above standardized testing. Hammill, D. D., & Larson, S. C. (2009). Test of Written Language—Fourth Edition. (TOWL-4). Austin, TX: PRO-ED. Disclaimer: The views expressed in this post are the personal impressions of the author. This author is not affiliated with PRO-ED in any way and was NOT provided by them with any complimentary products or compensation for the review of this product. A few weeks ago I reviewed the Social Language Development Test Elementary (SLDTE) and today I am reviewing the Social Language Development Test Adolescent (SLDTA) currently available from PRO-ED. The Social Language Development Test: Adolescent (SLDT-A) assesses adolescent students’ social language competence. The test addresses the students ability to take on someone else’s perspective, make correct inferences, interpret social language, state and justify logical solutions to social problems, engage in appropriate social interactions, as well as interpret ironic statements. The Making Inferences subtest of the SLDT-A assesses students’ ability to infer what someone in the picture is thinking as well as state what visual cues aided him/her in the making of that inference. The first question asks the student to pretend to be a person in the photo and then to tell what the person is thinking by responding as a direct quote. The quote must be relevant to the person’s situation and the emotional expression portrayed in the photo.The second question asks the student to identify the relevant visual clues that he used to make the inference. A score of 1 or 0 is assigned to each response, based on relevancy and quality. However, in contrast to the SLDTE student must give a correct response to both questions to achieve a score of 1. Errors can result due to limited use of direct quotes (needed for correct responses to indicate empathy/attention to task), poor interpretation of provided visual clues (attended to irrelevant visuals) as well as vague, imprecise, and associated responses. The Interpreting Social Language subtest of the SLDT-A assesses students’ ability to demonstrate actions (including gestures and postures), tell a reason or use for an action, think and talk about language and interpret figurative language including idioms. A score of 1 or 0 is assigned to each response, based on relevancy and quality. Student must give a correct response to both questions to achieve a score of 1. The Problem Solving subtest of the SLDT-A assesses students’ ability to offer a logical solution to a problem and explain why that would be a good way to solve the problem. To receive a score of 1, the student has to provide an appropriate solution with relevant justification. A score of 0 is given if any of the responses to either question were incorrect or inappropriate. Errors can result due to illogical or irrelevant responses, restatement of the problem, rude solutions, or poor solution justifications. The Social Interaction subtest of the SLDT-A assesses students’ ability to socially interact with others. A score of 1 is given for an appropriate response that supports the situation. A score of 0 is given for negative, unsupportive, or passive responses as well as for ignoring the situation, or doing nothing. 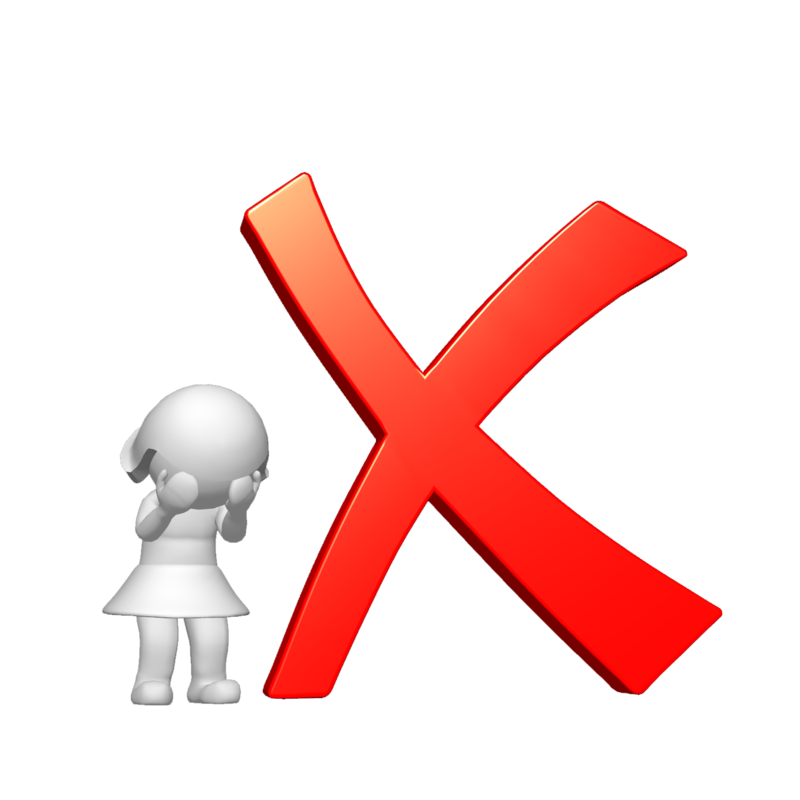 Errors can result due to inappropriate responses that were negative, unsupportive or illogical. The Interpreting Ironic Statements subtest of the SLDT-A assesses sudents’ ability to recognize sarcasm and interpret ironic statements. To get a score of 1, the student must give a response that shows s/he understands that the speaker is being sarcastic and is saying the opposite of what s/he means. A score of 0 is given if the response is literal and ignores the irony of the situation. understanding of the speaker’s intentions as well as “missing” the context of the situation. errors also can result due the the student identifying that the speaker is being sarcastic but being unable to explain the reason behind the speaker’s sarcasm (elaboration). How many of such students would know know the meaning of the word “sneer”? How many can actually show it? Overall, when you carefully review what’s available in the area of assessment of social pragmatic abilities of adolescents this is an important test to have in your assessment toolkit as it provides very useful information for social pragmatic language treatment goal purposes. Have YOU purchased SLDTA yet? If so how do you like using it? Post your comments, impressions and questions below. Disclaimer: The views expressed in this post are the personal opinion of the author. The author is not affiliated with PRO-ED or Linguisystems in any way and was not provided by them with any complimentary products or compensation for the review of this product.